Our Top Quality Sheds & Summerhouses, are all manufactured in our workshop using 2 x 2 framing, 3/4" tongue and grooved flooring and tongue and grooved redwood matchboard or loglap. 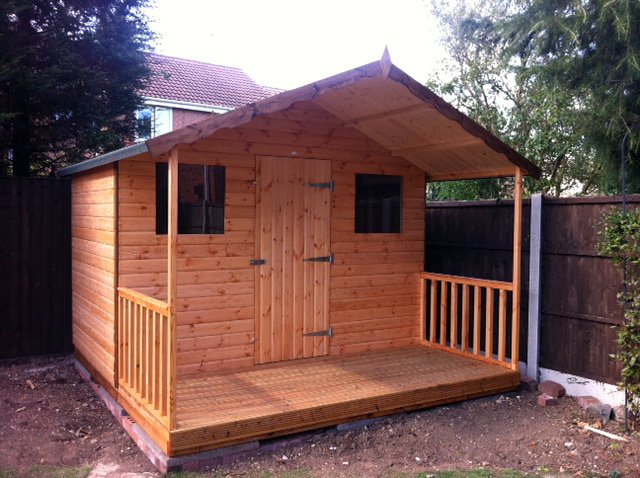 All our sheds and summerhouses are available in a spirit based golden, mid-brown or dark oak treatment. If you wish to customise your sectional building there are a variety of upgradeable extras: Various roof felts, toughened or laminated glass, double doors or extra doors. All Sheds and Summer House prices are inclusive of VAT. Click on an image thumbnail below to view more. Our most popular Summerhouse with joinery made windows and doors. Can be built in to sheds or summerhouses.